The "choose the right convex mirror guide" will help you decide which DuraVision convex mirror is best for you. The Convex Mirror Installation Guide shows how the DuraVision mirrors are mounted to walls and posts. The "convex mirror cleaning guide" provides a safe and easy solution to give your mirror a bright, clear reflection. DuraVision mirrors are trusted by safety officials, security forces, architects and professionals requiring the highest quality, durability and performance mirrors. Convex security mirrors are an effective surveillance tool in reducing theft in retail sites and vandalism. They also provide reassurance and improved personal safety in the office and other workplace areas where people are at risk. 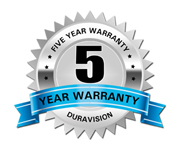 Our line of DuraVision convex mirrors utilize only 100% virgin, optical grade acrylic and stainless steel. This ensures a superior quality and long lasting reflective surface. Each series is designed and engineered to provide the clearest reflection and best durability. These acrylic convex security mirrors are ideal for retail and office surveillance as an anti theft device. Complete with a fully adjustable wall mounting bracket which makes it easy to install. Being adjustable to almost any angle makes these .. The DuraVision retail loss prevention full dome retail security mirror is ideal for 360o observation and to improve retail surveillance of large areas which are obscured by aisles and partitions. These security dome mirrors are aimed at pr..
Half dome security mirrors give you a 180o area of reflection. Using the dome top screws supplied, this mirror is wall mounted and is most effective for retail surveillance in T-Junction situations to see left and right of passageways and isles ..
Quarter dome security mirrors are ideal for viewing 90 degree corners for store surveillance of isles, shelving and partitions. The Quarter Dome mirror is mounted to the ceiling with the supplied Dome Top Screws. The mirror face is manufactured from .. Vehicle security and inspection mirrors are designed for viewing and inspecting on top, around and underneath vehicles which are difficult to access and hard to see. The lightweight ACM back (Aluminum Composite Material) makes it easy to handle but s.. The under vehicle search mirror is designed for rolling under vehicles or large objects to view and inspect areas which are difficult to access and thereby hard to see. The 4 x 2" castor wheels and lightweight ACM back (Aluminum Composite M.. The weather resistant acrylic outdoor convex security mirror is versatile and robust and will handle many outdoor surveillance situations. Complete with a fully adjustable wall mounting bracket (optional pole mounting accessories are available) which.. The stainless steel outdoor convex security mirror is unbreakable and ideal in high risk areas prone to vandalism. Complete with a fully adjustable wall mounting bracket (optional pole mounting accessories are available) which is easy to install and ..
Deluxe stainless steel traffic mirrors have a galvanized steel back and hood and feature a powder coated traffic orange color for for enhanced visibility. The stainless steel face is virtually indestructable which makes it ideal in traffic situations..